Rare convertible Collectors Edition! Collectors Edition yellow with ebony leather interior. Excellent running 5.7L V8 engine with automatic transmission. Back cloth power convertible top is in excellent condition and works great. Air conditioning blows ice cold. Power windows and door locks work as they should. Excellent original condition interior with the exception of the typical door panel crack on the drivers side. 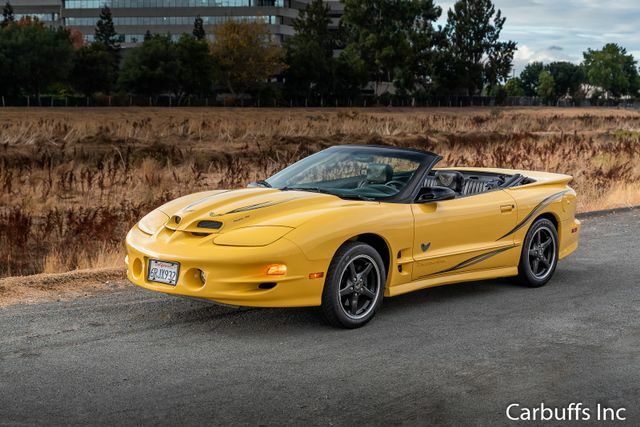 1 of only 1,041 Collectors Edition convertibles made for the final year of the Pontiac Firebird Trans Am. Out of that total there were only 492 automatics made. This car was purchased by the current owners from Mazzei Pontiac in Pittsburg, Ca. on 4/17/2003 with only 213 miles on it. The Trans Am had been used by the dealership as an event car for local shows, etc. The Trans Am did have a scratch on the rear tail panel that they had the dealership repaint before they took delivery. The rest of the paint is in great condition with just a few stone chips on the passenger headlight door. The car currently has only 15k original miles. It has been garage kept and has had the oil changed every year with synthetic oil. Still riding on the original tires. Runs and drives excellent with plenty of power and good looks. Additional items included are the original front license plate filler, original Trans Am and Collectors Edition manuals, NOS set of decals and a Collectors Edition trophy mat. Original convertible top boot is still in the trunk in its original bag. Original purchase documents included with all names matching the current registration.